Takom is the first manufacturer to address this widely used tank and has produced a very nice kit of the vehicle. With care, it gives you the option of building either a WZ-121A or the WZ-121B/C variants. Like the other new mold kits it offers a number of options but as with some of the DML kits it is a “mix and match” kit with 88 new parts as compared to the T-54B kit. I have a good history of the vehicle as prepared by Russian authors (the Chinese are rather paranoid about their tanks, and one chap who did a history of the new ZTZ-96/98/99 got something like six months in prison for publishing it) and all of the main features in the kit match the WZ-121s there and also in various museums (ex-Iraqi vehicles). Like the other kits it comes with pre-clipped single link OMSh track links which are very nice on the face but have two ejection pin marks on each one. However they are the “proud” type and not recessed so a few strokes with a sanding stick solves the problem. Still it is a bit tedious but for my money is still better than having to fit individual guide teeth to each link! Takom provides some of the best instruction booklets going in my opinion. It is concise and has good, clear exploded drawings of the parts as well as clear indications of what goes where. Assembly starts with the lower suspension parts, and to their credit the rocking shock absorbers come with action arms to fit to the road wheel arms, a nice touch. It has three-piece track tensioners and nicely done idler wheels at the front of the hull. Step 2/3 covers the wheels; as noted you have a choice of which wheel centers to use. But they have the overexaggerated rubber molding lines on the tires which are a bit excessive. Modelers may wish to sand them down before use, especially on the running surface of the tire. A few modelers who have started work on the kits indicate that some of the tires do not fit properly so you will need to play around with them before cementing them up to see what works best. There have also been observations the grease caps may be a bit oversized. Step 4 is the hull roof; this combines the glacis necessary, the turret race, and the correct engine deck together as well as the louver details for the engine deck. Etched brass grilles are installed at this point. Most of the hull assembly is pretty much perfunctory assembly but in Step 8 and Step 16 there is a call for some holes to be drilled in the fenders. Unlike other T-54/55/62 kits up to this point Takom actually provides the fuel lines for the external fuel tanks! Note that part of the lines are molded onto the right fender and care will be required to line up the tanks and the lines. They form a continuous loop through all three tanks and back into the engine bay. The Chinese kept the T-54 design parts so it uses the earlier single bevel fuel tanks (L12) even though both they and the later double bevel style is included in the kit. The next few steps cover detailing. Step 8 covers the difference between the A line tank and the B/C command tanks. While all kits use the same hull pan, Takom provides the correct Type 69 rear panel and then a small combing that completes the new fan shroud housing. One of the slickest features of the kit is the solution to the eternal problem of clean assembly of the 200 liter auxiliary fuel drums. The Takom take on this has them with two center sections that end at the attachment strap fittings and caps for the ends molded in one piece. Note that no MDK-5 canisters are included as an option; it is just the 200 liter drums. As with most Soviet/Russian tank designs (and as copied by the Chinese) the unditching log (Q6) needs some roughing up with a razor saw as it is too smooth to pass as wood. The turret has some nice touches such as a neat way to mount the machine gun (H25) and a flexible vinyl mantlet cover for the main gun. It comes with a choice of either rubber fording covers for the machine gun and sight or simply their brackets. While the kit comes with a full set of T-55A hatches and cupolas the model must use the proper T-54/55/Type 69 set on sprue X. It does have the proper full round hatch found on most of these tanks. There is no pretense of a gun inside the turret and only a small device to permit its elevation is provided with the two vinyl keepers as friction snubbers to hold the gun in position. From what the directions show once assembled the gun should remain flexible. With care the searchlight assembly will snap into place and also elevate and depress with the gun if so desired. The kit only uses the full set of options so it comes with indentations for the smoke grenade launchers and the “boom shield” array. This actually consists of 29 parts and covers the entire turret, but actual vehicles photographed or captured show the front sections were often not installed. These are the ones over the smoke grenade launchers and would include parts U6, U7, U19, U20, U1, U8, U12, and U18. The kit does not have a “dazzler” but if you have photographic evidence of one with it and the old Tamiya T-72M1 kit that device could be used. Finishing directions and markings cover six vehicles: an IRGC vehicle captured by the Iraqis during the Iran-Iraq War (sand with Farsi markings on skirts, red/white turret flash); Iraqi Army Desert Storm (Note: this is a 3rd Armored Division vehicle with the yellow bore evacuator and white stripe indicator, sand overall but the markings and turret numbers are incorrect); Iraqi Army 1991 (sand/green mottle with registration plate 7190); Royal Thai Army (sand/brown/green mottle with bort number 7); Iraqi Army 1991 as preserved at Saumur, France (sand/green mottle with bright sand replacement skirts, registration number 7393); Iraqi Army post 2003 (sand with Iraqi flag and registration number 14). A small sheet of decals is provided. There are sets of decals and finishing directions available from after-market companies and should expand choices as these were widely deployed and used during the 1980-1991 time frame. Note that in Step 33 the smooth-barreled Type 54 is the proper weapon and you get a nice DshKM for the parts box. The main gun is a two-piece type but as I have often repeated a few minutes with a Flex-i-File will ensure it looks the part and means you do not have to purchase a turned aluminum barrel unless you want one. 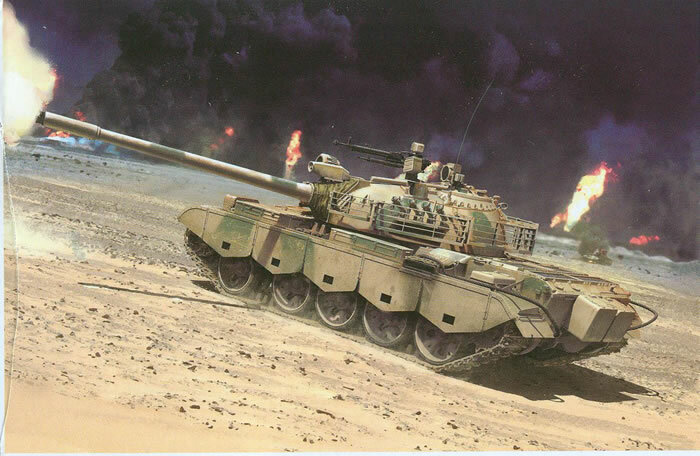 As this was a popular tank Takom has allowed for that with no less than NINE finishing options! These include: PAVN, Saigon 1975 (overall dark green, PAVN stars and bort number 843); Red Army winter service (white over protective green, bort 412); Red Army GSFG Operation Dunai August 1968 (protective green with white cross, tactical march order markings and bort number 019); Pakistan (green over sand mottle, white turret band, bort number 81/18); Syria October 1973 (three color grey/green/sand mottle, bort number 017/710); Democratic Republic of Afghanistan (protective green, bort number A1840); Egypt 1967 (sand overall with blue/red) rectangle on the turret); and Egypt October 1973 (sand/black/brown mottle, bort number 77); Iran (sand/brown mottle, Farsi characters in red). Decals are provided on a nice sheet but it should be noted that the Arabic numbers read the same on both sides so a bit of care is needed in matching them. The Syrian one is probably 710 as they copied the Soviet pattern in their divisions at the time (e.g. 1xx/3xx/5xx/7xx for regimental numbers). Overall this is a very nice kit with only a few glitches here and there to annoy the purist. The tires are probably the most annoying but a few minutes with a sanding stick will eliminate most of the overwrought rubber seams molded into the tires. But thanks to the breadth of its usage in 1991 there are a wide variety of finishing options for those who have good resources. Thanks to Takom via Charlie Prichett for the review sample.